JBS Instruments is now a division of AquaCalc LLC and specializes in the creation of portable stream flow measurement devices like the AquaCalc Pro Plus and the AquaCalc 5000. These instruments are used along with mechanical current meters by hydrographers and biologists to measure the amount of water flowing in streams, rivers and other open channels. With a large display and improved user interface it’s the next generation of automated stream flow measurement computers. 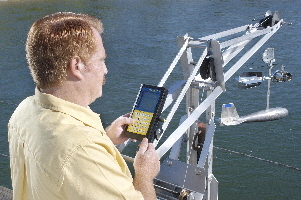 This device is used in wading measurements and suspended measurements using mechanical current meters, USGS mid-section method protocols and approved equipment. The Digital Magnetic Head for the Pygmy Current Meter converts an existing meter from the hard-to-adjust cat-whisker to an accurate magnetic/electronic sensing device. Bridge crane and cableway measurements are much easier. 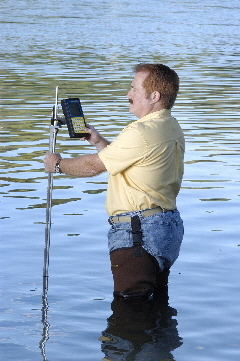 Faster, more accurate wading measurements. Measurements can be exported and displayed in your computer for enhanced reporting and quality control. 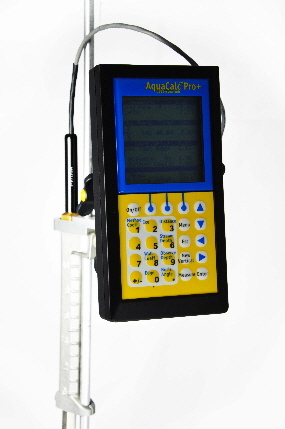 The AquaCalc DataLink program is used to download and display measurements from your AquaCalc. This new version includes the new Section View, and Section Reports, which show you interactive graphs and exportable reports of your measurements. 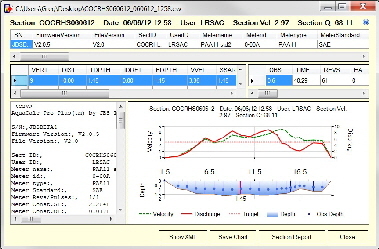 DataLink 3 also allows automated downloading of measurements from the AquaCalc Pro Plus. Click here for details and to intall AquaCalc DataLink. 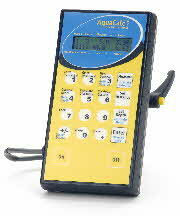 The AquaCalc 5000 displays revolutions, elapsed time, velocity, distance and depth for each station. It calculates total stream discharge at the push of the button.